Palmar loop ID3: Psychosis & IQ? Your responses encourage me to ask more questions. I have another important question. It is important to me, so please give me some knowledge. I found this very interesting & here is the reason. I have collected about 50 handprints or photos of various people for my initial study. In the hands of those doing manual labor & similar jobs (chaffeur, deep jungle tribesman, etc), the palmar ridges were easily visible with rough hands. But what jumped out at me was that all of them have a huge palmar loop between middle & ring finger. In 2 hands, this loop extends almost to the line of heart. This loop was missing on the successful intelligent people. I never thought of the significance of this difference, but after reading the research paper, I suspect that this palmar loop also indicates low IQ, apart from psychosis or other mental maladies. What is your opinion please ?? I am very eagerly looking forward to your answer. Re: Palmar loop ID3: Psychosis & IQ? 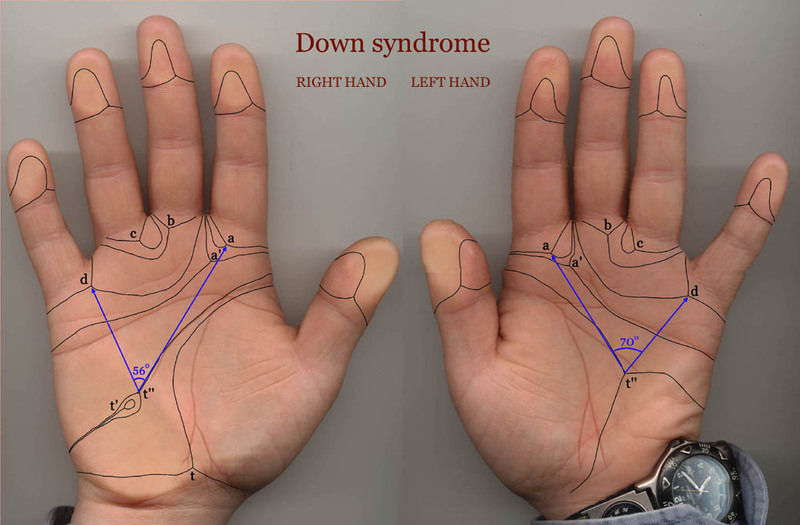 Interesting question, though I think there is no direct connection between IQ and the loop between the 3rd and 4th finger (this zone is called 'palmar interdigital zone 3' = ID3), because even though it is also known for it's high frequency in people who have Down syndrome and some other syndromes that are featured with low IQ... in my own studies I have also found that it is very often present in the hands of univesity students. However, I think it is important to look at the other aspects of the palmar dermatoglyphics as well... for example when this ID3 loop is featured with a high positioned triradius + the missing of a loop between the 4th and 5th finger, then the chances are falling rapidly that the person has a high IQ (large percentages of people with Down syndrome (60%), Patau syndrome, Warkany syndrome, Wolf-Hirschhorn syndrome & 18p syndromes have this specific dermtoglyphic combination in both hands... while it is not often seen in the hands of university students: not much more than about 2% - and if so, they are likely to have a disconnected headline in both hands as well). So, what I am saying is: though there might be some relation with IQ, it really requires a study of the dermatoglyphics in the full palm to draw any conclusions! OK, so this obviously means that my initial suspicion that the palmar loop may have a high correlation to IQ is incorrect. Well, I shall keep following the research. I noticed on your website that scientific hand reading has 3 dimensions: morphology, lines & ridges. As a layman, my thought is that the answer lies in some yet undiscovered combination of these 3 dimensions. This is of course assuming that the hand in itself contains self-sufficient markers. Thank you for your detailed responses Mr. Martijn. I truly appreciate it. learner wrote: OK, so this obviously means that my initial suspicion that the palmar loop may have a high correlation to IQ is incorrect. Well, I shall keep following the research. Yes, I think you now understand the loop more properly. And yes... combining elements from various dimensions is in my view essential for making a solid assessment (or diagnosis). I am currently working on an update for that website! Thanks for the info about the new site.